The climbs of the Andalucia (Southern Spain) may not be the most well known, but they are undoubtedly some of the best in the world. Most people look to the roads of Mallorca, Gran Canaria, and Girona for their next cycling holiday/training camp. While these are all great options, the Andalucia matches and even outdoes each of the aforementioned. The climbs of Andalucia may not be the most well known, but they are undoubtedly some of the best in the world. Most people look to the roads of Mallorca, Gran Canaria, and Girona for their next cycling holiday/training camp. While these are all great options, the Sierra Nevada matches and even outdoes each of the aforementioned. Why is this? Take Mallorca, for example, a major destination for cyclists looking to escape to nice weather and roads. While the roads are well surfaced in Mallorca they are far busier than the roads here in Andalucia. What about the climbs? It is a struggle to reduce our local climbs into a top ten list, whereas Mallorca is essentially one well known climb (Sa Calobra) with a hundred cyclists on it at anyone time. Girona is closer to Andalucia in terms of quieter roads and a nice selection of climbs, but where it falls behind is its weather. Girona is further north, and as a result, has poor weather each year from January to March. We are lucky that we're only 10km from the coast of the Costa Tropical which boasts the best winter climate in mainland Europe. Girona is small city and it takes at least 20mins to ride into the countryside whereas with CSN we're based in a village in the middle of the countryside. So there's no time wasted contending with traffic. There are no shortage of exceptional climbs in Europe, but even then, many aren't rideable all year-round. With the exception of the Pico Veleta (Europe's highest paved road), all of the climbs we have come to love here can be ridden throughout the year. It's not by chance that a significant number of pro cyclists choose the Sierra Nevada as a base for their training camps. This is probably the most spectacular climb in the area. With 36 kilometres of steady gradient, the climb tops out at 1,358 meters above sea level. This is the old road from the coast to Granada city, locally named La Carretera de la Cabra or The Goat's Path. In the past, the road was used by mule drivers taking fish from the coast to the markets in Granada city, taking almost two days and traversing the mountain at night to avoid the daytime sun. Starting in the sleepy seaside village of La Rábita. The village was once of significant strategic importance for the ruling Nasrid dynasty and the kingdom of Granada. In later years the village developed as a fishing port as well as exporting wine, raisins, almonds, figs, beans and chestnuts, which were the produce of the surrounding villages in the local Alpujarra region. Starting from La Rábita provides you with the longest side to Haza del Lino, with a total of 1259m climbed in the space of 26.4 km. This is quite a steady climb, with a great surface and an average gradient of 5% keeping you company as you wind yourself up the mountain. Starting in the always interesting Órgiva, this climb must be counted as one of the most beautiful around. After leaving the town, you quickly lose count of the number of hairpins you've gone around as you climb up towards Cáñar. This climb is steep, but excellently surfaced, with sections above 15% commonplace. Once you find your rhythm on this climb it really becomes a joy to ride. The views down onto Órgiva and the valley and mountains surrounding it are especially stunning on a sunny day. This 8.3km climb is sure to make you smile, the switchbacks reminiscent of Italy's infamous Stelvio climb. One of the closest climbs to our base here in Velez de Benaudalla, the Los Guájares climb is also one of the nicest around. The first 6 km up to the lovely little village of Guájar-Faragüit are rolling, with an easy gradient up until the right turn in the village, where the gradient increases. If you want to stop for coffee on the way up, a cafe sits just on the right turn in Guájar-Faragüit. The road surface is fantastic the whole way up, and while grades of 10% are commonplace for the last 8km, the road certainly doesn't feel as steep as this. The road is well surfaced and traffic is minimal. As you climb up in the direction of one of Spain's highest villages- Trevelez, the views never disappoint, as the mountains of the Alpujarras rise up around you. As you reach the last section of the climb look out for the mines on your right hand side. Trevelez, resting at 1,486 metres above sea level, is one of the highest villages in Spain. The village is famous for the quality of its air-cured Iberian hams. Because of the cooler climate- due to the altitude and the village's position within a gorge; conditions for curing ham are ideal. This approach from Órgiva is 34km in length. While long, Órgiva to Trevelez is not a hard road by any means. Gradients are relaxed the whole way up, not to mention the frequent sections of flat or downhill which provide excellent recovery. Once you find your rhythm you can really relax and take in the views of the valley floor below you. Starting in the formerly Roman village of Torvizcon, this climb is a tough one. A steep climb with sharp hairpins, be advised to take care if descending down this road. Averaging 6%, but with multiple sections of over 15%, this is a hard climb for even the fittest. As you ascend this road the views are second-to-none, looking up the road your eyes are met with stunning views of the back of the Sierra Nevada. In spring, this climb is particularly beautiful, with almond trees and their pink blossoms starting to spread from the lower slopes making their own way up the mountain day by day as the warmth of spring grows. "There is one place here that I keep thinking about — the antennas at the top of Sierra de Lujar. I haven’t spotted a road leading to them, so we haven’t yet made an approach. I ask locals how to get to them but they’re not sure if it is possible at all by car, let alone by bike. It seems that nobody goes there, but surely there must at least be an access path leading to them. Eventually we find an old, narrow road full of holes. Looks like an adventure, and a challenging one at that." Another approach to Haza del Lino, the hairpins of this climb from the coast are a real spectacle. Starting in the the ironically named village of La Guapa (The Pretty One). Ironic as the village is far from pretty, but as you climb the view improves a lot. This route up to Haza del Lino is an unforgiving one, averaging a gradient of 7% for almost 17km. The first couple of kilometers are quite steep, but as you leave The Pretty One behind the gradient eases and the views improve. At 3,398 (11,148 ft) metres above sea level the Pico Veleta is Europe's highest paved road and consequently Europe's highest cycling climb. The meaning of the name literally translates as Pico or peak and Veleta meaning "weather vane", the name will perhaps take on a greater resonance as you approach the top. The climb starts just outside of the city of Granada at 750m and arrives at the summit of 3398m some 43km later. Cycling Holidays, Training Camps & Bicycle Hire Andalucia, Southern Spain. Only one hour from the airports of Malaga, Granada or Almeria, we are situated in the beautiful Andalucian village of Velez de Benaudalla. 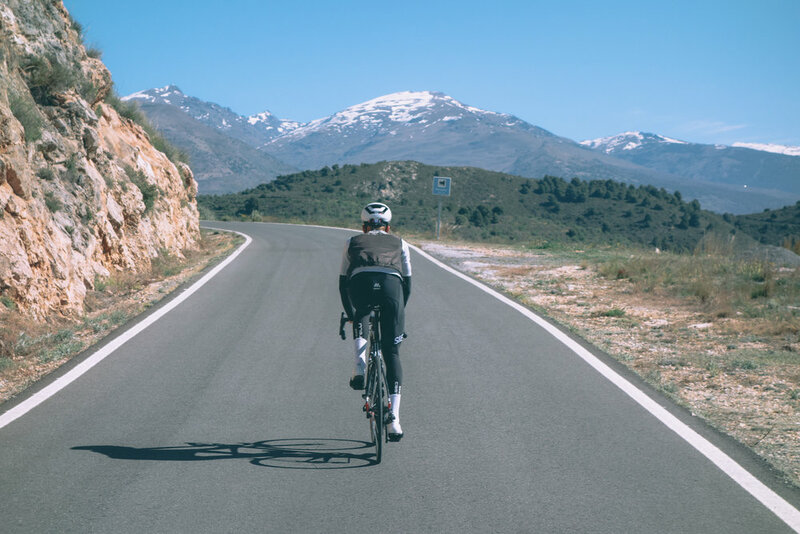 Nestled on the foothills of the Sierra Nevada mountains and only a few kilometres to the coast of the Costa Tropical, make Cycle Sierra Nevada the perfect location for your next cycling holiday or cycling training camp.